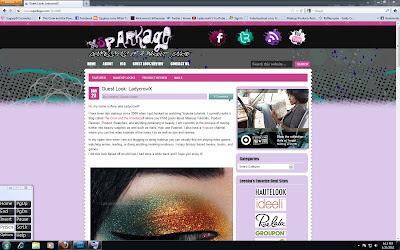 The Crow and the Powderpuff | A Creative Makeup & Beauty Blog: Featured on Xsparkage Today!!! So when I first started getting interested in makeup Xsparkage was one of the first Youtuber's that I followed. I love her colorful and creative looks and looked forward to every tutorial/video that she posted each week. I'm so excited to have one of my looks featured as her "Guest Looks" this week! I saw that! I love the look of yours that was featured. Congratulations! Love it, and i'm always trying to recreate your looks. Could you do a quick post on the camera you use, your photos are awesome. congrats!! She was the person who I learned how to do my eyeshadow! I love her videos!